You've probably all heard about this, but in case you've been living under a rock in Mars with your fingers in your ears, former Athletic Jason Giambi admitted to using steroids. Well, this is some bad news. Tim Hudson and his agent have set a deadline of March 1 for the team to sign him to a long-term contract. If a new contract isn't in place by then, Hudson will break off negotiations and play out the 2005 season, becoming a free agent. Hudson is certainly the team's best pitcher, so this isn't a situation that will delight A's fans. Hopefully either the team can get something done, or Hudson can fetch full value in a trade. 2 Pics from ESPN.com Are they both Zito? 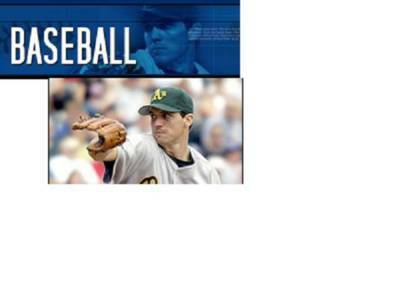 The baseball logo header that ESPN.com uses looks very similar to this Zito picture which I found in another ESPN.com story. Are they the same pic? I think they are not, because the blue pic has a shinier face and bigger ear, but it is surprising to me how similar they look. The glove in the blue pic apears to have lettering on it too. But look how similarly the shirts are bunched, and the arm angles and face and even the hairlines appear very similar. I am not even sure the blue one is Zito, but the similarity is striking. Friday the wife and I went to downtown San Jose. We heard about the Harvest Arts and Crafts Festival and also wanted to check out a skating rink downtown. We were totally plastered with Christmas. It appears San Jo has decided to deploy Christmas. The Harvest Festival had every possible Christmas gift and decoration and about half the booths were blasting their own boombox of Christmas tunes. Then we went to look for the ice rink. The park across the street from the convention center is jam packed with Santa's and trains and fake snow, and of course blaring Christmas music. It's the day after Thanksgiving, and every possible trace of Thanksgiving decoration has been removed to make way for more red and green stuff. We found the ice rink but it was not for public use Friday, they were doing a Nutcracker on ice show. This segues right into my movie recommendation. Are you tired of Christmas already? Feeling cynical? I made a list of my favorite movies but I need to add one here. Bad Santa! Bad Santa is a story about a drunk suicidal angry department store Santa who robs safes. Billy Bob plays the Santa role that should have won him an Oscar. The profane putdowns are just hysterical. I rented it from Netflix and it almost got me over the feeling that Christmas is a terrible marketing ploy. I don't know if blogging is really reporting. Sometimes it is, sometimes it isn't. Some people think it is part of "the Media". This morning before work I was watching some morning newscast where they did traffic every 6 minutes and then went to a story from the SF zoo. Tinkerbell, one of their elephants is getting a new home in a wildlife preserve! They are moving Tinkerbell. Wow. There were 2 newscasters, the woman delivered the breaking story, then the co-host at the end added, totally insincerely, "That ought to be a lot more room for that little elephant." Amen bro. This is just the kind of hard-hitting journalism I asprire to write.